WASHINGTON (CNS) — The recent releases of several men from the U.S. detention facility at Guantanamo Bay, Cuba, is seen as a sign that other transfers are in the works by advocates for the more than 140 men still being held. Fawzi al-Odah, a Kuwaiti national, was transferred to authorities in his homeland Nov. 4, while five other men were transferred for resettlement in Slovakia and Georgia Nov. 20. Those releases were followed by another Nov. 22 as Muhammad al-Zahrani was sent to his homeland of Saudi Arabia after being held for 12 years. All had been determined no longer to be a threat to U.S. national security. Five other Taliban members were released in an exchange for U.S. Army Sgt. Bowe Bergdahl in May. Al-Odah was the first inmate to be cleared under a recently established review panel re-evaluating some detainees previously considered too dangerous to release. Under current protocol, the Pentagon has notified Congress that nine other detainees have been cleared for transfer. Six were to be sent to Uruguay, but their transfer has been delayed as the country prepared for a runoff presidential election Nov. 30. The Center for Constitutional Rights reports that of the 142 men in detention, 72 have been cleared for release but remain mired in legal limbo. Bill Quigley, who is a law professor at Loyola University New Orleans and has worked with the center, is among those calling for the release of the men. “It is an absolute violation of our law and international law and nobody even says that it’s not. It’s just a pure political decision,” Quigley told Catholic News Service. The Guantanamo Bay prison has been controversial since the first detainees arrived Jan. 11, 2002. Reports of torture have surfaced throughout its history and authorities turned to force feeding of inmates who joined a hunger strike in early 2013 to protest their incarceration. Overall, 779 men have been detained at the facility, according to the Center for Constitutional Rights. The Office of the Director of National Intelligence reported that as of July 15, 629 people, including nine who died, had been transferred out of detention. Detainee advocates contend that holding men indefinitely without charges or facing trial violates international human rights law. President Barack Obama has expressed concern that keeping Guantanamo Bay open poses a threat to national security because it serves the motives of Islamic militant groups in recruiting new members. November’s transfers came as congressional Republicans have been more critical of the releases, calling them irresponsible. Congress repeatedly has blocked attempts to close the prison and transfer detainees to U.S. soil or to allow all but a handful to face trial. Rep. Buck McKeon, R-California, retiring chairman of the House Armed Services Committee, called the recent transfers reckless. He was one of two members of Congress — the other being Sen. Kelly Ayotte, R-New Hampshire — who asked Obama Oct. 30 to suspend transfers. They referenced a Fox News report that said between 20 and 30 detainees released since 2011 were suspected by intelligence and Defense Department officials of joining Islamic State and other militant groups in Syria. The report turned out to be inaccurate. A series of semiannual reports from the Office of the Director of National Intelligence show that between Dec. 29, 2011, and July 15, 2014, four of 21 released detainees either had returned to or were suspected of returning to terrorist activities. For detainee advocates, the focus remains on the men cleared for release but with nowhere to go. Hawthorne suggested that the number of transfers may pick up now that the midterm elections have passed. He said the White House may try to place men in third-party countries before additional restrictions on their transfer are imposed by the new Congress as Republicans strengthened control in the House and rose to power in the Senate. Wells Dixon, senior attorney at the Center for Constitutional Rights, said it is the president’s responsibility to act on the transfers. Meanwhile, Witness Against Torture, established by several Catholic Workers and others in 2005 with the goal of closing the facility, will continue its annual weeklong witness and fast in Washington Jan. 5-13. 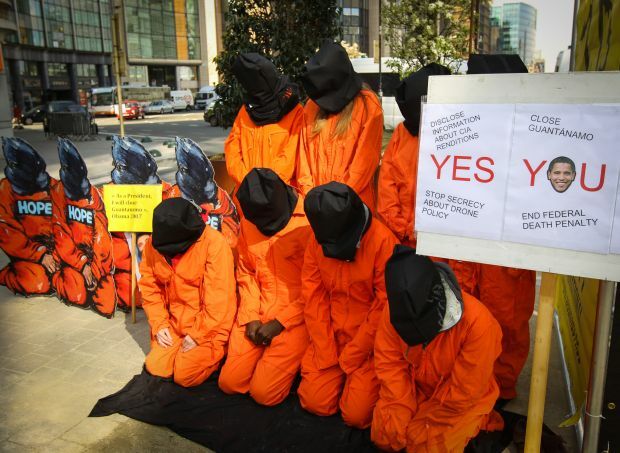 Chris Knestrick, a Catholic Worker in Cleveland and Witness Against Torture participant, welcomed the releases, but expressed concern that the Guantanamo Bay center remained open. He said the organization was encouraged by recent comments by Pope Francis who decried the detention of prisoners without trial Oct. 23 in a meeting with representatives of the International Association of Penal Law. “That’s important for us at Witness Against Torture that people like Pope Francis continue to speak out against the death penalty and indefinite detention. We need strong moral guidance from him to offer moral support,” Knestrick said.